News and Events | West Pikeland Land Trust | Assisting landowners and township officials in planning open space conservation. Those associated with an award given to Chester County municipalities that work to preserve open space within their boundaries said the efforts have a relatively less well-known benefit — adding to the favorable economic climate found throughout the county. 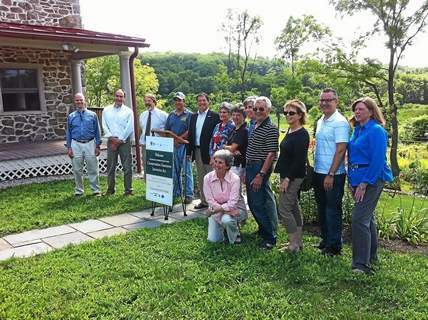 This week, Natural Lands Trust, acting in partnership with the Chester County Association of Township Officials (CCATO), named West Pikeland the county’s second annual Growing Greener Communities Award. 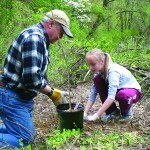 The award recognizes a Chester County municipality that has engaged in a dynamic initiative designed to save land, steward natural resources, and connect people to nature, according to a press release issued by the land trust, headquartered in Delaware County. Ted Gacomis, board member for West Pikeland Land Trust, accepted the award on behalf of the township alongside Board of Supervisors’ Chairman Ernie Holling at the CCATO spring conference, held at the Desmond Hotel in Malvern. In an interview Friday, Holling expressed gratitude for the honor, and noted how the township’s efforts at preservation have dovetailed with the county’s new economic development model, VISTA 2025. “Obviously we are pleased that CCATO and NLT chose to honor the efforts we’ve made over the years,” Holling said from his office in Exton, adding that the state Senate and House of Representatives had made note of the award as well. “The county’s new economic development strategy, VISTA 2025, emphasizes the importance of protecting our county’s quality of place. Our work is consistent with that plan. “A commitment to investing in the County’s beautiful natural areas, which the residents of West Pikeland Township exemplify, will be critical to Chester County’s continued economic and cultural vitality,” Holling said. This year’s review committee — made up of CCATO officers — found multiple strong contenders among the nominees, but ultimately determined that West Pikeland should be recognized for its recent conservation efforts, according to the NLT release. West Pikeland’s qualifying projects (which had to occur in 2014, though they could be part of an ongoing initiative) included the purchase of a trail easement on 27 private acres of along Street Road, which the township had identified as a Priority Scenic Roadway in its Conservation and Open Space plans. The property sits on a ridge top and offers panoramic views of open fields. 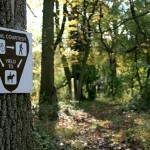 The easement will enable the Township to connect Natural Lands Trust’s Binky Lee Preserve to the north and the Township’s Pine Creek Park to the south by trail. Holding also pointed to the work the township did in 2014 on the White farm, a 67-acre property that the township bought in 2013 for $5.2 million. The future park is the largest parcel the township has ever purchased with its Open Space funds, and last year it hired a landscape architect to begin making the park a reality. Approximately one third of the park will be used for active recreation, including field and court games, and the remaining two-thirds will have two miles of walking paths for passive recreation. The park’s trail system also will provide access to the Mill at Anselma, a National Historic Landmark. To date, the township has received $2.5 million in grants for the park’s development. 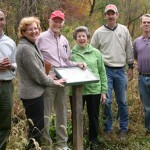 According to the NLT release, the township established the all-volunteer West Pikeland Land Trust in 1999. The trust was instrumental in rallying residents’ support for an open space tax referendum, which residents approved in 2007. Since then, tax revenue earmarked to support open space protection in the township has generated between $500,000 and $600,000 each year. The ability to commit significant local funds to open space projects has made West Pikeland eligible for grant funding through state and county programs. “Protecting this landscape from future development was strategic to preserving the rural character and scenic views that West Pikeland residents value,” said Curt Grogan, West Pikeland Land Trust’s vice president. The West Pikeland Land Trust (WPLT) has released a report, “Accomplishments of the West Pikeland Township Open Space Preservation Tax Referendum,” with which the group is celebrating five years of successful land preservation. Formed in 1999 by the West Pikeland Board of Supervisors, WPLT promotes and facilitates the preservation of open space in the township to protect its natural resources and provide recreational opportunities for the community. Led by a group of citizens, WPLT has worked with local landowners, township officials, county and state governments, and other conservation organizations since that time to preserve a total of 386 acres of open space in West Pikeland. In November 2007, the township’s first open space referendum was passed. The movement provided a stable source of funding for WPLT and allowed WPLT to be more strategic; to better secure other sources of funding from the county, state, and foundations; and to act quickly when opportunities arose to conserve critical open spaces. From 2007 through 2012, 149 acres of open space were preserved, 2.2 miles of trail right-of-way were secured for recreation and better health, $1.5 million in land value was donated by landowners who chose to preserve their properties and 273 trees were planted to improve habitats and keep streams clean. According to a recent study produced by the Delaware Valley Regional Planning Commission, open space enhances home values, protects property, filters drinking water, and cleans the air. It also furnishes low- or no-cost recreation that saves money and improves health, creates jobs, and generates state and local tax revenue. To request a copy of the WPLT’s report or to learn more about the group, individuals may visit www.wplandtrust.org. EAST NANTMEAL — The pending expiration of a federal tax incentive for land conservation has added a sense of urgency to efforts to make the incentive permanent. Despite the bucolic setting of Friday’s rally — the “Great Marsh” preserve off Route 401 — that sense of urgency was evident among the several speakers from a variety of conservation organizations who have successfully used the incentive to preserve sensitive wetlands, woodlands and farmland open space. “There are 11,000 acres of preserved land within three miles of this spot,” said Bill Kunze, who runs the Pennsylvania office of The Nature Conservancy. “Let’s get this done. Without it, places like this may not be preserved,” said D. Andrew Pitz, executive director of the French and Pickering Creeks Conservation Trust. GreenSpace Connect – If the ideal summer getaway for a young child (who can’t use electronic devices) could be devised, the White property in Chester County would be it. Pickering Creek, stocked with brown and rainbow trout, runs through woodlands and meadows waiting to be explored. If fish aren’t your cup of tea, the whinny of a mare in the paddock might speak to you. At 15 acres, this property has been eyed for its development potential to become yet another subdivision. Fortunately Charles and Alyssa White have chosen to preserve the land. West Pikeland Township and Chester County have funded the easements, and Natural Lands Trust (NLT) holds the conservation easement that will restrict future development and preserve the land. Daily Local News – ribbon-cutting ceremony last month celebrated the opening of the new Pickering Creek Trail in West Pikeland Township. For the West Pikeland Land Trust, in was another big step toward its ultimate aspiration. The West Pikeland Land Trust was created in 1999, as building encroached on the area. Chester Springs, PA– A ribbon-cutting was held on October 20th to celebrate the opening of the New Pickering Creek Trail in West Pikeland. Part of the funding for the project was provided by Marjorie and Arthur Miller, Jr. who were on-hand to cut the ribbon and walk the new trail with members of the West Pikeland Land Trust. They were joined by Beth Briglia from the Chester County Community Foundation, West Pikeland Supervisor, Harold Hallman and other commmunity members, including David Kline, whose sixth grade class from the Montgomery School helped to plant over 200 trees along the creek in April. The new trail is part of a riparian buffer restoration project that preserves 14 acres owned by Charles and Alyssa White, which were put into a conservation easement held by Natural Lands Trust that will allow public access to Pickering Creek. This segment is part of WPLT’s mission to create a community-supported “Open Space Network” of preserved public and private land that connects trails, parks, historic sites and recreational areas. The White property is adjacent to the Township’s Pickering Grove Park and also links on its eastern corner to Natural Lands Trust’s Binky Lee Preserve, also a partner in this project. Mike Groman, Beth Briglia, Marjorie and Arthur Miller, Jr., Harold Hallman III and David Kline celebrate the opening of the new Pickering Creek Trail in West Pikeland. 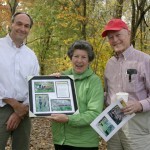 Mike Groman presents Marjorie and Arthur Miller, Jr. with a commemorative gift at the opening of the new Pickering Creek Trail in West Pikeland. The trail is open to walkers, bikers and horseback riders. 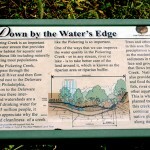 Educational signs along the new trail provide information about preservation and the Pickering Creek. In the current economic environment, township budgets everywhere are stressed. The West Pikeland Land Trust has been working with township officials to make the most of every dollar available. “By utilizing private resources provided by people like the Millers, we are able to maximize the scope of our projects,” said Mr. Groman, “Projects like this enhance recreational opportunites for township residents, while preserving natural resources.” The new trail begins on Pikeland Road, just off Route 113 and runs along the Pickering Creek. 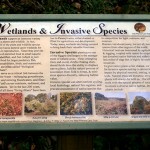 Signs along the trail provide information about the value of wetlands, native species and the Pickering Creek. Students join the effort to preserve valuable resources in West Pikeland. 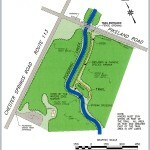 Chester Springs, PA – April 20th 2012 – Work has begun on the New Pickering Creek Trail in West Pikeland. 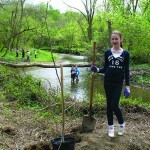 As part of that effort, on Friday April 20th, sixth grade students from the Montgomery School helped to plant over 200 trees along Pickering Creek as part of a riparian buffer restoration project. The preservation project was developed through the work of the West Pikeland Land Trust (WPLT), with a grant provided by The Marjorie L. & Arthur P. Miller, Jr. Fund, a fund of the Chester County Community Foundation, West Pikeland Township’s Open Space Fund and Chester County’s Preservation Partnership Program. The project preserves 14 acres owned by Charles and Alyssa White, which were put into a conservation easement held by Natural Lands Trust that will allow public access to Pickering Creek. This segment is part of WPLT’s mission to create a community-supported “Open Space Network” of preserved public and private land that connects trails, parks, historic sites and recreational areas. The White property is adjacent to the Township’s Pickering Grove Park and also links on its eastern corner to Natural Lands Trust’s Binky Lee Preserve, also a partner in this project. A ribbon cutting for the trail will occur this summer. On Friday, April 20th, sixth grade students from the Montgomery School helped to plant over 200 trees along the new Pickering Creek Trail in West Pikeland. Fifth and Sixth Grade Science Teacher and Environmental Program Director, David Kline (back left) and WPLT’s Vice President and Education Committee Chair, Mike Groman (back right) supervised the riparian buffer restoration project, assisted by sixth grade students from the Montgomery School. 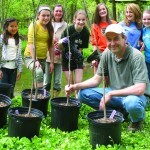 Mike Groman and some of the Montgomery School students prepare to plant some of the large trees. Jim Rowan, WPLT’s Director and Development Committee Chair, helps plant a tree with one of the Montgomery School students. Each of the 212 trees that were planted along the trail was supported with a stake and a Tubex Tree Shelter to provide protection from animal and wind damage. In the current economic environment, township budgets everywhere are stressed. The West Pikeland Land Trust has been working with township officials to make the most of every dollar available. “I am appreciative of West Pikeland Land Trust’s dedication and commitment to our community over the years. At a time when the township is under budget constraints, West Pikeland Land Trust’s use of its funds to enhance the recreational activities of our residents is an invaluable service,” said Dr. Richard Bright, member of the West Pikeland Board of Supervisors. “Further, by utilizing the private resources provided by the Majorie L. and Arthur P. Miller, Jr. Fund they were able to maximize the scope of the project,” he added. 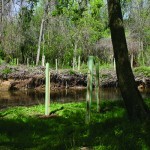 WPLT purchased 200 small trees and a dozen six foot trees for planting in strategic locations to help prevent erosion along the banks of the creek, which has been designated as a high quality stream by the PA Department of Environmental Protection. The project provided a valuable learning opportunity for David Kline’s 6th grade class at The Montgomery School. “As part of our involvement with Sustainable Watersheds PEAS (Programs for Environmental Awareness and Sustainability), we are always looking for ways to immerse students in an issue of environmental sustainability,” explained Mr. Kline. “We teach them the background story and science involved, give them a problem to solve, and challenge them to come up with solutions.” The Sustainable Watershed PEAS is one of several programs that were developed to raise awareness in students of environmental issues and empower them to become the conservation leaders and problem solvers in their communities. The students have also been learning about Brook Trout (PA’s State Fish) and what their needs are for survival. This “Trout in the Classroom” project is in cooperation with the Valley Forge Chapter of Trout Unlimited, and included raising 272 Brook Trout from eyed eggs in a classroom tank. The students released the last 78 of the fingerlings into the stream a few days before the tree-planting project. “These projects give students a chance to understand an organism that lives in the creek that they learn to care about and want to protect,” said Kline. “Raising trout provides a real world context for students to recognize their impact, roles and responsibilities in preserving and protecting our local watersheds. We encourage our students to become stewards of the Pickering Creek and we participate in annual monitoring to insure that our local watershed is maintaining its health,” he added. The West Pikeland Land Trust is an all-volunteer registered 501(c)(3) non-profit organization dedicated to preserving land by assisting landowners and West Pikeland Township in land use decisions; promoting conservation of open space, water resources, and historic places through education and community outreach; and protecting land by accepting and holding donated or purchased easements and monitoring for compliance. WPLT’s work is supported primarily through private donations. For more information, visit www.wplandtrust.org. Montgomery School is an independent, co-educational day school serving pre-school through grade eight in Chester Springs, PA. The School is dedicated to the development of each child in mind and body through academics, fine and performing arts, and athletics in an enriching cultural and physical environment. The School is equally committed to the development of each child’s character, with an emphasis on integrity, respect, responsibility, and service to others. To learn more, visit: www.MontgomerySchool.org. Montgomery School’s participation in the Trout In the Classroom program is made possible through funding provided by the PA Fish and Boat Commission, PA Trout Unlimited and PA Department of Education environment ecology. Brook trout eggs, trout food, technical assistance and educational support is provided by PA Fish and Boat Commission and PA Trout Unlimited.